Anyone involved in parkrun will be well aware that there is a new milestone club in town. However, this one is not for running - it is for volunteering. To reach this milestone, a person must be credited as a volunteer on 25 different occasions. Like its running counterparts, this club has a reward in the shape of its own milestone t-shirt and along with the rest of the clubs, they are now supplied by Tribesports. 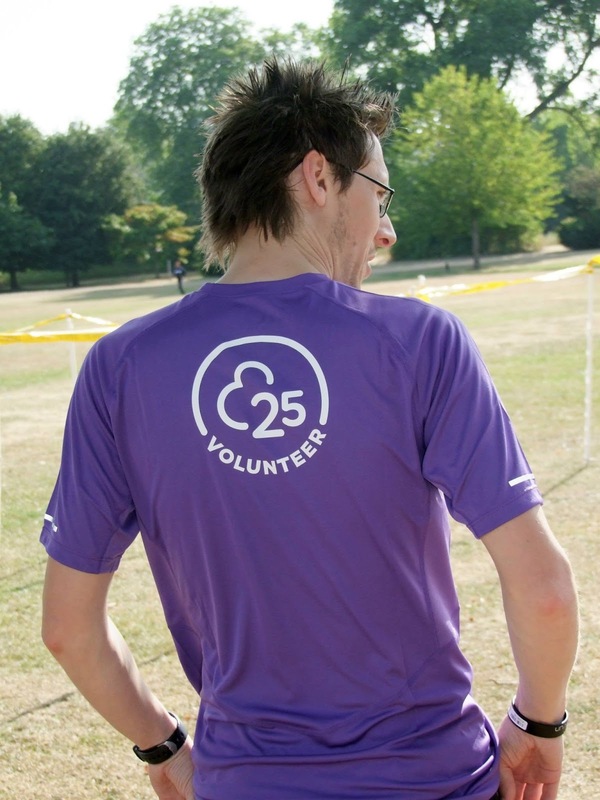 During the design process, parkrunners were given the opportunity to vote on a preferred colour for this new shirt, and as you can see from the photo below, the purple (eggplant) t-shirt won! In July 2015, the first batch of shirts became available to order, and as I had reached my 25 volunteer status way back in 2012, I was included in the first batch of recipients. I placed my order and the t-shirt arrived well in time for me to debut it at Dartford parkrun 49, which incidentally was also the last event of our first year. In an attempt to try to be helpful, I have provided some feedback on my shirt below. For reference I am about 168cm tall and about 56kg. I usually buy clothes with a 34 inch chest or a 28-29 inch waist. So basically I'm very similar in stature and build to your typical long-distance runner (Mo, Haile and Bekele etc..). Bad: The waist area is a little baggy on me, which I was expecting considering the 'regular fit' description. However, it is the length of the garment that really disappointed me - it is almost 5 inches longer than what I would consider the 'correct' length for me. I have to tuck it into my shorts to avoid looking like I'm wearing a dress (the shirt is strategically tucked in in the photo above). I have read some comments from Tribesports advising people to downsize if they want to have a closer fit and take full advantage of the technical features. However, this was never an option for me as the small mens shirt (36-37 inch chest) was the smallest option available. I will of course continue to wear the (tucked in) shirt with pride, but I would urge the powers that be to look again at the sizing options. Considering the 'regular fit' design and the advice to downsize, I definitely think there needs to be an extra small option (not just in chest size, but also reflected in the length of the shirt - remember, not all of us are over 6ft. tall) in the mens range. Please do not take this post as me being ungrateful and complaining about a free gift. I am just trying to give some open and honest feedback. The fit of a t-shirt (or clothing in general) is a very personal thing, and I appreciate that you can't please everybody. The people at either end of the size scale are always more likely to encounter problems of this nature and it's not the first time I've had this problem. If this was an ordinary run-of-the-mill running shirt that I had ordered and paid for, I would be returning it for a refund as I simply wouldn't wear an item of clothing with the aforementioned length issue. But of course, this is much more than an ordinary t-shirt. Anyway, the subject of the post was Dartford parkrun event 49. The day started with a playground workout which consisted of an circuit training style session. I used an app on my phone to set 30 second intervals with 30 seconds of rest between each period of work. I used the following system - 'upper / core / lower' with the upper alternating between pulling (biceps and back) and pushing (chest, shoulders and triceps) movements. There's a lot more to it than that, and I'll write about my playground workouts in more detail in a later post. After setting up the course with Richey (ED), I took on the role of timekeeper again and it really was an exercise in finish funnel perfection. Both timekeepers and the tokens stayed in synch for the entire run. There was no funny business in the finish funnel (unlike the previous week) and the results were expertly processed while I spent a good deal of time having a good ol' chin-wag with a fellow parkrun tourist.